Nothing gets people so riled up as a chance to see Tibet. That plateau has been talked up higher than it lies above sea level. Our group of exchange students hardly proved exempt from the pull of the mystical plateau. Beijing University offered us a few travel lines, but so many opted for the line with Tibet in it that all but two of the lines had to be cancelled for lack of travelers. Most of my peers desired to see Tibet above all else, and signed up without knowing much of the other sites along the way. I could not blame them, the chance to see Tibet proper does not present itself often. In the end we all piled into the Tibet travel line anyways, heading off to learn about Buddhism. I like to say that even if it did not include Tibet I would have picked it to explore one of the religions I was raised with. To this day I am not sure if I was speaking true or trying to diminish my shallowness. Either way, it did not matter. Almost every site on the list I knew and wanted to see, from the old capitals of Luoyang and Xian to the temples on the Tibetan plateau to the sacred peaks and historical cities of Sichuan. Our first glimpse of Tibetan Buddhism came after we landed in a small city called Xining, the capital of a far off province called Qinghai. At first glance it did not seem Tibetan but it no doubt was a part of the plateau and influenced by a mesh of cultures, including Tibetan and Han Chinese. Trade between Han, Mongolian, Turkic and Tibetan empires allowed Xining to flourish. It rose up right on the edge of what the Chinese call Qinghai and the Tibetans call Amdo, two names for a similarly assigned space. However, we came to Xining for a nearby monastery more than the city itself. Still, the city had a significance worth exploring. At the intersection of several cultures, Xining’s probably seen a lot of every sort of people. Mongolians, Tibetans, Muslims and Chinese all played a part in its history. Now it stands as the largest city on the Tibetan plateau. None of that translates into its skyline or across its urban sprawl. Landing in the Xining airport. Large though it may be for the plateau it is a small city on China’s scales. 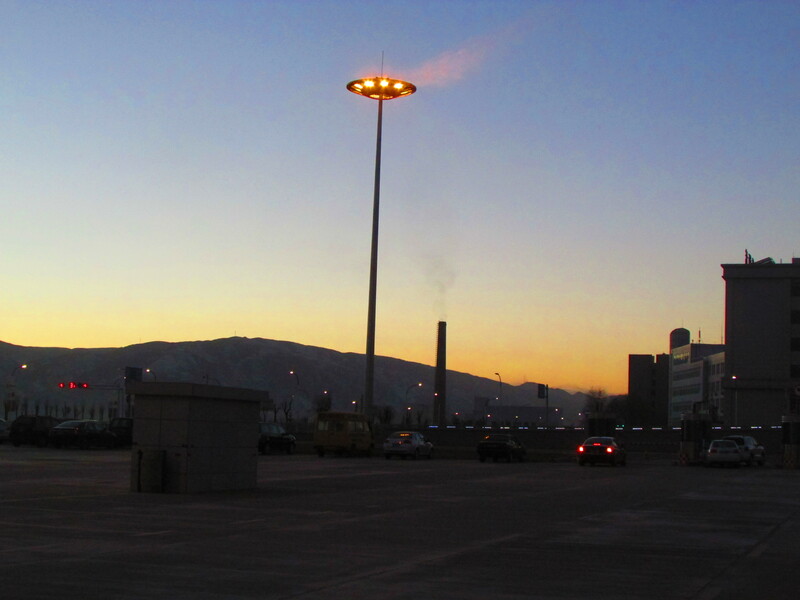 Of all the places I had been in China none felt as empty and spacious as Xining. To be fair to Xining, we did not stay there for very long and only went exploring on one quiet night. Besides, Xining had a very special charm all its own. Few places felt quite as honestly human as Xining. This is a city with more work than pomp. The city lacked the grand skyline of China’s megacities and it could not sprawl out endlessly like Beijing does. Rather, it exists and only ever existed as the simple and practical version of itself, not reaching out to be a Big Apple or even a Second City. Xining did not feel dressed up, a rarity for a country rediscovering the clothing of State Capitalism and Confucianism. Despite my all too natural reluctance to go out, I ended up heading out after dark to explore the town with a group of friends. We struck a path along a street next to an empty canal and walked a short while before stopping at corner store. A young man stood half asleep at a slightly dilapidated chrome counter. He welcomed us in and bade us to buy whatever we liked, though he spent much more energy welcoming in a white cat. I could not blame him; the cat seemed much more interesting. The cats paint a cheerier picture. Stray cats are a fixture along the streets of Beijing and Xining. People leave little piles of kibble for the cats to eat and let the felines come and go. The small office where we met at Beijing University even had a cat all its own, affectionately named Xiao Bai (小白) meaning “Little White.” It came in for food but sometimes stuck around for company. 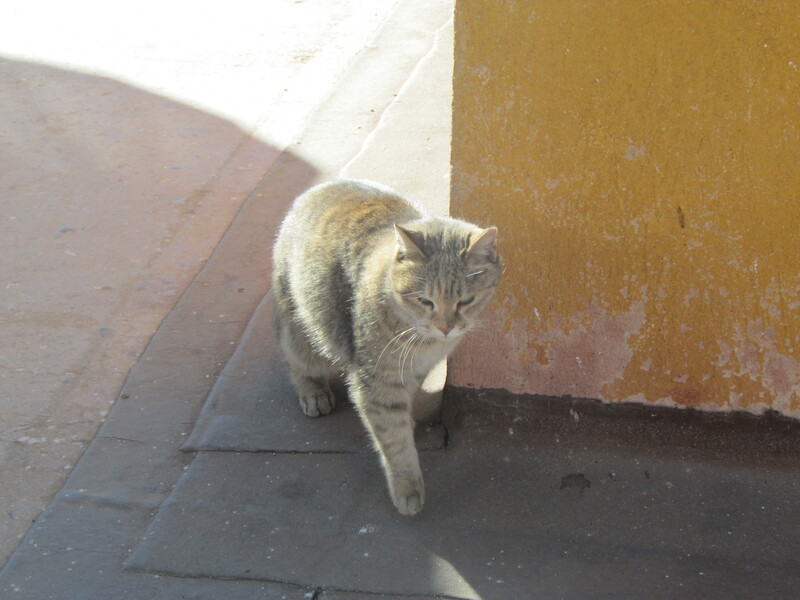 A stray cat I met in Lhasa. We got our bottles of water and had the man up front ring us up. He was fairly friendly and pretty tired. He tossed up three fingers to indicate the price, then dropped a word I did not know. Spotting the confusion, he smiled and cut back to the Beijing dialect, common speech. China’s tongues do not just divide at Cantonese and Mandarin but at the boundaries of every province. Dialects can differ right down to the county line, sometimes so steeply separate that they could be languages all their own. All across the country most people can speak Beijing dialect at least like a second language. After that we ambled onward for a while, realizing that few places outside of that corner store and some McDonald’s were still open. We thought everyone was asleep until we came upon a super poppy tune emanating from a distant plaza. A bunch of senior citizens had gathered at a nice and open place to do some nighttime group dancing. They quickly invited us over, curving hands and mouthing “Lai 来! Lai 来! Lai 来!” So for a while we did a little group dancing in a foreign plaza. Some older women helped show me the ropes and by the end I was deep in the formation trying hard to stay in step. My compatriots pulled me out of the group and we went on walking. Past that point we did not have so much to see. Before we knew it we had stumbled upon another plaza, this one even more massive and filled with some strange sculptures we did not understand. After some loitering a nearby McDonald’s called our name, mostly by merit of being open when everything else was closed. The magic of marketing has made McDonald’s and other fast food brands a middle and upper class treat in China. The menus feature American style foods often with a Chinese twist, featuring fried chicken with a Sichuan sauce and a curry chicken plate served with fries. One of the biggest culture clashes I have ever had was over a pizza hut in Chengdu, where I ate a freshly made pan pizza underneath glinting chandeliers while watching well-dressed businessmen chat at a nearby table. Though this McDonald’s proved pretty interesting too. I got another bottle of water to have when I woke up next morning and sat at a table a slight way away from a middle aged Chinese woman sowing something nice and colorful. At first nothing seemed amiss. Gradually a tragedy etched into her expressions and she started to sob and heave quietly in the corner. There we were, foreigners in one of the furthest parts of a strange land all alone on the second floor of a McDonald’s save some workers and a woman crying into a quilt. The moment struck me as I felt simultaneously very far and incredibly close to her. My language skills could not grapple with her troubles and my social skills would not have been up to the task either. Still, I was one of the few witnesses to a breakdown, one of the warm bodies nearest to some unfortunate thing that had brooded until it spilled over. No travel guide in the universe could have explained to me how to handle the situation. Stories started to swirl around in my mind, trying to understand what might have happened. A friend of mine and I started to speak carefully in English. We wondered openly what to do, but also what this woman’s tale was. Had she lost a child recently, went for a night time walk and ended up knitting and sobbing? Was she just distressed at things at home or homeless entirely? There was no way to know even though we tried to figure it out. The most respectable thing to do may have been to stay silent or talk about other things. Perhaps we should have lent a hand despite language barriers. We should have tried to do better by her. We should not have given into curiosity, but if we were not weak to exploratory impulses we may never have ended up in China. After that we just walked back and relaxed at the hotel. It was a very human city and it gave me plenty to think about even if not much happened while I was there. The bell would call for us very early next morning and we’d end up hastily eating a bare-bones breakfast before going to Kumbum Monastery. The tale will continue next week with the monastery. I will leave a few photos as a bit of a teaser.